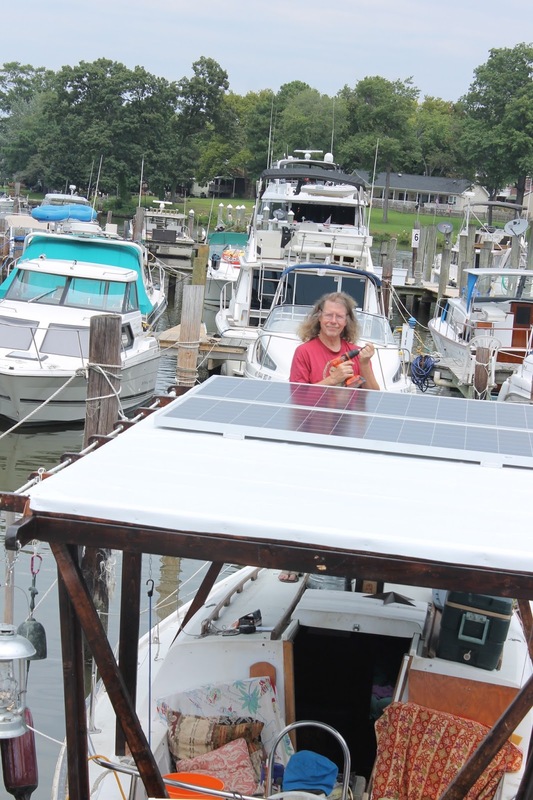 Boat living, tiny house living, van living, tent living, cave living. . ..one of the advantages of virtually ANY living other than the standard suburban home is that your small spaces and tiny carbon and energy footprint means you can have an unprecedented amount of freedom from utilities, services, and their associated bills. One of our objectives in this livaboard enterprise has always been to get as far off that dependence as was possible. 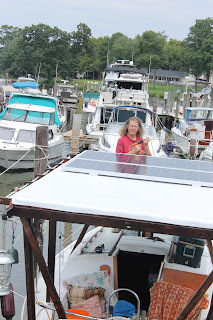 The Floating Empire's original 200W of solar was fine for electronics and internal lights. . .that's about it. Our original shantyboat “The Floating Empire” went a long way in that direction. 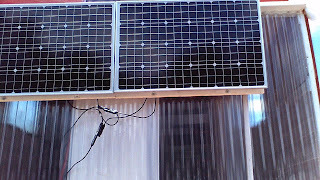 We were able to filter and pump our own water, and our scant 200W solar panels provided enough power for our electronics and interior lighting, but, sadly, not for refrigeration or travel. One of the driving forces behind getting our new vessel “Tesla's Revenge” was to take care of this. 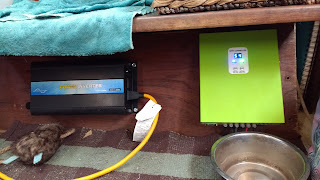 So in our right minds and everything and after large amounts of caffeine, we've begun the process of getting fully off grid, with new components and a new battery layout, with an eye to producing and being able to store enough power to both live and travel unconnected from shore power. 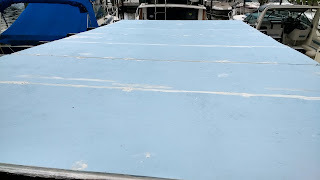 Here's the hardtop, caulked and painted and ready for the membrane covering. It EXACTLY fits the four new panels. . . .I didn't ask where I as gonna stand to put them on, now did I? After a couple of days of the knuckle busting job of rewiring our 8 deep cycle batteries in two series sets of four (48V, remember?) and dragging wire and installing our new 48V true sinewave inverter and the MPPT controller to regulate the power going from the solar panels to the batteries, we embarked on the perilous task of mounting the first two of our four solar panels on the hardtop. Actually, we wanted to do it the day before, but there were 16kt winds, and I figured I'd wind up somewhere over White Marsh hanging from a flying solar panel. Stylish, yes, but the landings can be messy. One great place to acquire solar panels (if you're looking for large and high output) is solar installers. They buy the things by the palletload, and after they finish an installation, they'll often sell off the remaining few panels at cost or nearly so. We dealt with the VERY nice folks at Ameresco Solar in Chase and managed to acquire a couple of 325 watt, 24 volt panels for a very reasonable price. Great. Okay. 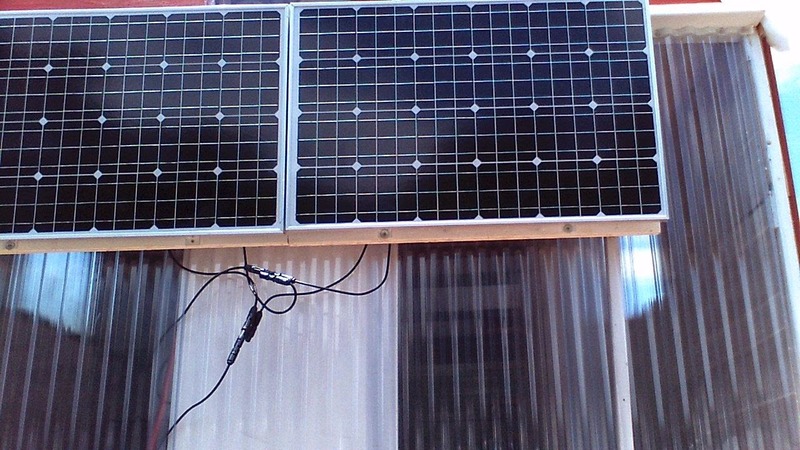 Finding a place to mount the inverter and the MPPT solar controller was a bit of a challenge as well. We opted for beneath the companionway step. So now all I have to do is managed to install two 6 ½ by 3 ½ foot, forty pound solar panels on the top of a moving vessel. We are VERY fortunate to have some lovely slipmates who came over to help us get them on top of the wheelhouse, which made life a lot easier. Of course, though I figured my spaces PERFECTLY for the installation, I forgot to ask one simple question: Where the hell do I stand to screw these in? The resultant, somewhat comedic installation routine resembled someone playing a game of “Twister” over a bed of black, hot, potentially shatterable glass with a cordless drill in one hand. This was one of those moments when extra limbs might have come in handy. Certainly, my wife's suggestion that I put on taller shoes (no kidding, it worked) made it possible by about 2/3 rds of an inch. Regardless, we got it done, clipped together the wires, and low and behold, we were powered up and off grid. . . .
. . . .sorta. . . It's been four years since we launched The Floating Empire, and that's about the lifespan of the original bank of deep cycle batteries. Frankly, they're getting a bit elderly and are no longer up to the task. We can produce plenty of power now, but can't store enough of it to reliably make it through all evenings and cloudy days (a problem also faced by municipalities and utilities working with renewables. Tesla's working on it.). So I'm spending my days at the moment shopping for another block of 100AH batteries to replace our old bank. For the moment, though, we have just dramatically reduced any power consumption we had (which wasn't much). The current system can provide power for all our internal lighting, electronic gear, refrigeration, fans, and assorted small appliances without being plugged into shore. As soon as the new battery bank goes in, We'll be completely disconnected. Then we put in our 4.7KW drive motor and other goodies, and another two panels. . .
Where am I STANDING to put in the last two panels? I have no freaking Idea. I've been considering min kota electric outboards (2hp - 1.4Kw)... for my houseboat. I follow your blog all the time. Keep up the good work..Make a LOT of mistakes and tell me about them. Now what fun is that? Should be placing the motor order next week. . . . still conferencing with them about what we need. I am VERY interested in that Paddlewheel idea. Please included LOTS of pictures and explanations. For example...how and where did you get the motor, why kind of drive (belt, chain, shaft, etc) . We've been meaning to speak to you about that :)....I'll be posting a full post on the equipment shortly (the motor and controller have been shipped as we speak. . .or, uh, type). Initially we'll be using the existing driveshaft and propeller on the boat hull to test out the battery/charging/motor/speed control systems. The paddlewheel will come a bit later as soon as we get the electrical bits sorted out, but we'll get there. Stay tuned. If I might ask, where are you getting the motor and associated electronics? Everitt, we placed our order with WildernessEV.com, who have been wonderful folks with which to work thus far. The customer service of some of the other companies we contacted was nonexistent, and it made us leery of doing business with them. Brian at WildernessEV has been great at answering questions, making suggestions, and in general being helpful. That gave us the confidence to order from them. If you still had your mast, you could work out a skyhook. Or, build a scaffold to bridge the work area and do an inverse "Michaelangelo" while prone. I once worked out that if you could average 800 watts 24/7, you could handle a 2-burner electric stove and other seemingly power hungry appliances with a fresh battery bank. It was part of a dream of an all-electric sailboat with batteries as internal ballast. The fresh battery bank, is, at the moment, the issue, but we're shopping for new cells. The "skyhook" idea was enough to make me want to have a little lie down. . . . .
the 'stump' as a sky hook (and anchor light support)? lots of boats (larger ones) have cranes. I dunno how one would support it. This was deck stepped, and I don't know how you'd keep a shortie upright. I've been considering twin wheels..that would allow for differential power...it would make the boat VERY agile and manueverable..
the question is...how to do that? two motors? a single motor...a differential...and brakes? I wait your reply with baited breath. With electrics, I should think two drive motors would be a natural. Probably less weight and certainly far less complex than some kind of differential transmission system.